Broken...with bits missing. That's how Niamh, senior prosecutor for the CPS, feels when she wakes in hospital severely injured with no knowledge what happened--for the past ten years. A tall man in a firefighters uniform claims he's her husband. While he's everything she's ever dreamed of in a man and more, she doesn't know him. And if he was so important why can't she remember? Was there something so terrible, so painful in her marriage, her mind has suppressed it? First on the scene at a horrific accident, Jared Harkin is devastated to find his wife one of the injured. He's already lost a child, can he live through this? Niamh survives the crash, but awakens with ten years missing and no memories of their life together. Determined to help her remember the past and their love, he sets about wooing her all over again. But are some things best forgotten? As Niamh struggles to remember, the investigation into the accident reveals foul play. Did her recent caseload have anything to do with the attempt on her life? Or was it someone closer to her? As bit and pieces of memory return, the attacker strikes again. Can she piece together the whole of her past before it's too late? Dressed in her black gown and white wig, Niamh Harkin sat in Crown Court number three and sent up a prayer that she would do her best and that justice would be done. As senior crown prosecutor for the Headley Cross Crown Prosecution Service, she hoped she was beyond pre-trial jitters by now, but this case could prove to be as long and messy as it was big. The preparation had been awful, with files disappearing, and witnesses vanishing or changing their stories, due to death threats. Having finally got the case to court, she owed it to the victims to ensure the defendant was put away for a long time. The Jonathan Acre case had made the national news and the public gallery was full to the rafters with reporters, and everyday folk alike. All of them eager to catch a glimpse of the man accused of a string of mafia type murders. The TV and ordinary cameras, prohibited under the current legal system, remained outside the court building. Thus sketch artists drew furiously on their pads to record the images for the evening news and the morning papers. Niamh was dead against the proposed changes to allow cameras inside the courtroom. The media circus needed to stay well away from criminals and victims alike. They needed to protect the anonymity of jurors who weren’t permitted to speak to anyone about the cases they heard at all—even after the case was completed. The jury was finally sworn in and seated. The introductory speeches concluded. Sitting under the Royal Coat of Arms at the bench, Judge Matheson looked from his papers to Niamh. The gold trimmings on the judge’s red gown caught the sunlight streaming through the barred and frosted windows. His long white wig rested on his shoulders, and he regarded her over the top of his glasses for a long moment before pushing them up his nose. “Mrs. Harkin, you may call your first witness.” His gravelly, yet quiet voice resounded in the hushed courtroom. Niamh turned and glanced at him. She picked up the file and opened it. There was a nod from the defense counsel, and he twisted toward the dock for a moment, gesticulating at his client. Niamh took her seat and waited apprehensively as Mrs. Luckett came in. The court usher escorted the woman to the witness box. She looked terrified, her shoulders shook, and she kept her gaze down on the floor. Niamh glanced over at the dock to catch the expression of utter panic on the defendant’s face, as Mrs. Luckett placed a hand on the Bible and took the oath. Then Niamh rose to her feet and smiled at the witness. “Your Honor, might I have a word with my client?” Miles Kingsman got to his feet. “Of course, Your Honor.” Niamh sat and twisted her pencil in her right hand, watching the agitated conversation at the dock. The voices were kept low, but from Kingsman’s stance, it wasn’t what the defense barrister wanted to hear. Niamh was unable to suppress her smile as Judge Matheson promptly dismissed the jury and remanded the convicted man into custody until sentencing the following week. She gathered her papers. Someone blocked the light in front of her. It could only be one person. “That was a dirty trick, Niamh,” Miles Kingsman hissed. “Of course not, Mr. Kingsman.” Why had he gone all formal? Niamh picked up her files and briefcase and got to her feet. “I don’t do threats, Mr. Kingsman. I leave that sort of thing to your clientele. I deal in promises and the truth. Now if you’ll excuse me, I have a pile of paperwork that needs attending to.” She swept past him, wanting nothing more than to de-robe and head back to her office. She’d put the papers in her briefcase in the robing room. Ice slid down her spine. It wasn’t the first time she’d been threatened in her career. In fact she’d also received a series of death threats over the few weeks she’d been preparing this case. It came with the job, but this? This was something different. Miles was a colleague, even if they were on opposite sides of the fence. Niamh bent to retrieve her files, snatching them off him. “Mrs. Harkin?” Concern filled the judge’s voice. “Everything’s fine, Your Honor.” Niamh took the last of the papers and shoved them into her briefcase. Niamh left the court and headed swiftly down the corridor. Which part of her offhand comment had rattled Miles...unless he or someone he worked with really did have something to do with the files disappearing? He stood to gain much if he’d won the case. He’d only gone into pubic defending because she got the CPS job instead of him. Niamh turned. The last thing she wanted was a conversation with a witness, but she smiled and listened before taking the letter and, promising to read it and take the appropriate action when she got back to her office, hurried on her way. Once in the robing room, Niamh changed out of her robes and hung them back in her locker. She left the court via the back entrance to avoid the press. Taking a few deep breaths of the damp October air, she speed dialed the fire station, hoping Jared would be there. Despite everything that was happening between them, her husband’s voice always calmed her. Besides, she’d promised to tell him how she’d got on in court. Jared looked up from the pile of equipment he was cleaning at Cedarwood Fire Station. “Be right there.” He stood and brushed the dust from his uniform trousers. Tugging down his navy T-shirt, he ran to the office. “Who is it, Skippy?” he asked the firefighter sitting at the desk. “Your wife. Make it quick.” Pete Callaghan, the duty officer for Green Watch, known as Skippy due to his Australian accent, rose, moving to the side to give Jared some privacy. “Love you too, Jarrie Jace.” Her voice sounded stilted as she gave him the standard answer. Did she mean it? He dismissed the thought. No matter how rough a patch they were going through, Niamh had never lied to him. She hated liars as much as he did. Jared hung up, tore the message specifying the details of the fire from the printer, and ran out into the main section, shouting as he went. “Both pump and ladder, house fire at One Five Four Whitgate Road, persons reported.” He handed the sheets to the drivers of both fire engines and pulled on his fireproof clothing. The familiar surge of adrenaline filled him. He loved his job and the fact that what he did saved lives. 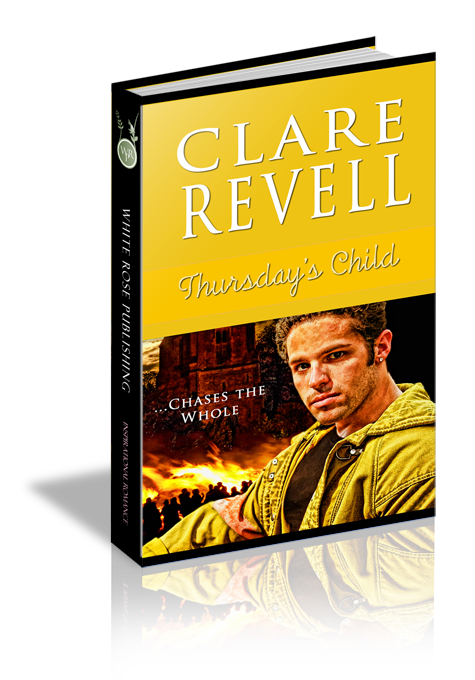 Climbing in the fire engine, he leaned back in the seat and took a deep breath. Lord, be with us on this shout. Protect us, help us do our jobs to the best of our abilities. Give us the strength to save lives, to be alert and hear the weakest of cries for help. Enable me to give my best. You alone know what awaits us on this shout. If I am to lose my life, Lord, be with Niamh, and protect and comfort her. Above all, grant me the courage to sacrifice my life in the line of duty without thinking twice about it. A hand touched his leg. He opened his eyes and looked at Phil Rodgers, the watch manager. “Yes, Sub?” It was kind of funny how they all still called him by his old rank title. The new one of ‘Watch Manager A’ didn’t have the same ring to it. “Praying.” He held the gaze of the senior officer. The fire engine pulled to a stop outside a blazing house. “Here we go.” Jared tugged his helmet on securely and jumped out.